Zello is a messaging app that focuses on audio over the traditional text messages. 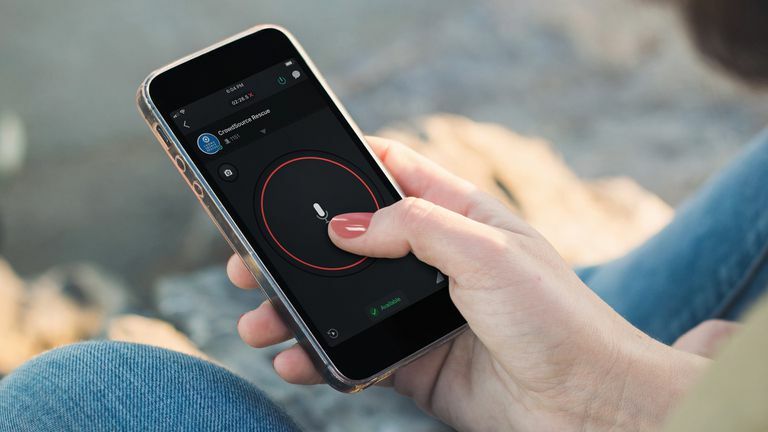 Unlike Skype or WhatsApp, which function more like traditional telephones with continuous two-way communication, Zello uses a UI that's more akin to a walkie talkie. This sort of app is often referred to as a walkie talkie app. From your Zello Contacts list, tap the person you wish to communicate with. Perform a long press on the large circular microphone button. If you're using the Zello app on PC, the button will be long and rectangular and will be located along the bottom of the app window. While pressing the button, talk into your device's microphone. Your contact will receive this audio almost immediately in real-time. Release your finger from the button when you want to stop talking. Does Zello Work Without Internet? Zello requires a constant internet connection from either a Wi-Fi or cellular signal to function. The official Zello apps have very little functionality when offline. Where Can I Download Zello? Zello has free official apps for iOS and Android smart devices which are available in the Apple App Store and Google Play Store respectively. A PC app is also available from the official Zello website. After installing the Zello app on your device, open it and tap Sign up. You will be asked to create a Zello username and password and to enter your email address and phone number. Entering your phone number is optional but doing so will make it easier for you to find your friends and vice versa. The Zello PC app lacks a lot of the functionality of the iOS and Android versions and can only add contacts by manually searching for usernames and email addresses. Here's how. Type the user's name or email address in the field. If you've entered their information correctly, you should see their name and profile picture. Click on it to send them a contact request. There are several ways for adding friends in Zello on iOS and Android and they're all located on the same screen. Here's how to find the add option on the Contacts page and how to use each method. Tap the + button in the lower-right corner. From the Contacts page, tap the + button. The Zello app will ask for access to your device's address book. Tap OK. The app will now automatically add contacts who have Zello to your contact list and you will also be able to invite friends to Zello by tapping on the Invite button next to their names. If you know the username someone is using on Zello, you can search for them by tapping on the circular + button, selecting Search for Zello contact, and typing in their name. To add a contact via QR code, tap on Scan QR Code then tap on OK when asked for permission to use your camera. Your camera will now turn on. Place your friend's QR code in front of it to scan it. If you've saved their QR code to your device, tap on the small picture icon in the top-right corner to import the image manually. Your friend will be added as soon as the QR code is read. Tip: Make sure to scan the QR code from within the Zello app and not via another barcode reading app. A QR code is a type of barcode that can be used to store information such as phone numbers, addresses, or in this case, a Zello username or channel name. Scanning a profile QR code will instantly add a Zello user to your contact list while scanning a channel code will add you to that Zello channel. Zello QR codes are automatically created for users and channels and don't need to be manually made. Here's how to find your personal QR code on Zello. Tap your profile picture. A small menu should appear along its bottom half. Tap the barcode icon in the lower-right corner. Your barcode will appear. You can now show this barcode to a friend for them to scan or take a screenshot of it for posting on social media or sending via email.